How do we get out of our own stories? 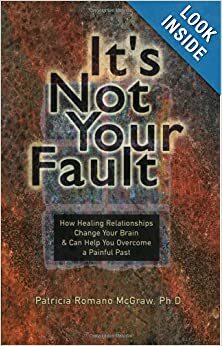 It’s Not Your Fault: How Healing Relationships Change Your Brain and Can Help you Overcome a Painful Past by Dr. Patricia Romano-McGraw, is a book that challenges conventional “wisdom” about healing from emotionally destructive traumas and abuse. Simply put, you can’t think your way to happiness if you’ve suffered injuries as a child or youth. Yet every day, millions of adult Americans who suffer from emotionally devastating mistreatment at the hands of family members, friends, acquaintances, or strangers receive this dangerous message from a multi-billion dollar self-help industry. As a result, millions try to put advice about “healing yourself” into practice. Yet millions of sincere, intelligent, and highly motivated people who have followed all the popular pathways for self-healing still feel depressed, anxious, unloved, and unlovable. This engaging and highly readable book, based in the author’s professional experience in treating those who suffer from the devastating effects of emotional trauma, offers hope for those who suffer and those who care about them. Dr. McGraw describes how trauma affects the brain and, therefore, one’s ability to carry out ‘good advice’; explains the subtle and hidden process of attunement and attachment that take place between parents and children, examining their impact on all future relationships; tells what is needed for healing to occur; discusses the profound health benefits of spirituality and a relationship with God in assisting and accelerating the healing process; and suggests how members of the helping professions can begin to tap the deepest, most authentic parts of themselves to touch the hearts of those they seek to help. Prayer for Peace in the World is Chanted in Farsi by Amir Haghighi, accompanied by Amy Stephen on the harp. Hauntingly beautiful, delivered with passion and warmth, it is a pure pleasure to listen to this Canadian husband and wife duo. Ajamu Ayinde is a Master Mental Coach. He is a Motivational Speaker who has spoken nationally and internationally on how to help student/athletes reach their health, fitness and performance goals. A veteran of the weight loss industry, he specializes in exercise motivation and diet adherence. He received instruction in Silva Mind Control, martial arts, meditation and self-hypnosis from a very early age. He graduated from Trinity College in 1991 with a degree in Asian Studies specializing in multicultural education and performing arts. He was certified as a Clinical Hypnotherapist in 1996 and later as a Trainer in 1998. Ajamu developed the M.E.N.T.A.L. Games ™ training system based on his sports psychology research, clinical experience and performance background as a professional dancer and martial artist. He was honored with the IACT Therapist of the Year award in 2004. He works with clients remotely via Skype. He’s also looking to connect with holistic doctors and dentists and others who work in this field and seek to live this lifestyle. Ian Huang, creator of the Ian Artistry brand, is a multi-talented artist whose art encompasses photography, painting, and videography. Whether it’s an emotional film about something he is passionate about or an exquisite photo of the beautiful Bahá’í Gardens, his art is sure to bring inspiration and joy to the viewer. Ian’s inspiration usually comes from the Bahá’í Faith. After serving at the Bahá’í World Centre and developing many of his talents, he decided to pursue artistic endeavors with the goal of inspiring people with works of art. His paintings, images, and video almost always have a Bahá’í Holy Writing or some sort of inspiration behind it. When Ian served as a gardener at the Bahá’í World Centre, he was very inspired by the beauty of the gardens and also learned powerful spiritual lessons, so he created a short-length documentary to talk about his recollections and learnings. It is titled, Holy Recollections. One of my readers wrote: Thank you for featuring Nancy Watters in your last newsletter. I recommend her highly for the Baha’i Chant Project, where she teaches groups simple, yet profound ways to chant, to draw closer to God. If you aren’t able to have her in your community, you can easily buy her DVD and sing along with her sound track, or create your own chants, using a simple step-by-step process demonstrated in her film. That story of Abdu’l-Baha breaking the fast was beautiful. Thanks for sharing. I had read it before but it’s been a long while. Great lesson in that service isn’t always pleasing someone and their wishes but rather that which is right and good for them. Standing up for truth and justice without giving up easily.